Naropa PREDICTED TO HIS STUDENT MARPA that in the future the teachings of the Dharma would become increasingly profound and the students successively greater. The proof of this prediction can be seen in the transmission of the teachings from Marpa to Milarepa and then to Gampopa. Gampopa integrated two traditions, that of the six yogas of Naropa, included the mahamudra, and the Kadam system of Atisha. 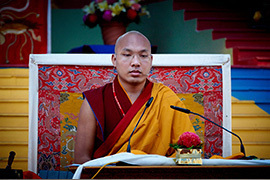 Next the Third Karmapa, Rangjung Dorje, who was realized in both the maha ati and mahamudra systems, integrated these two traditions. 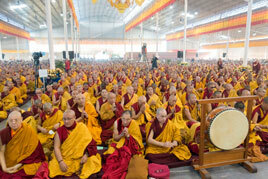 It was in this way that the profundity of the teachings increased. 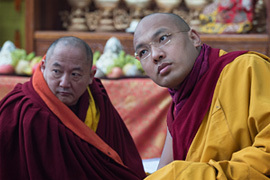 The tradition of mahamudra that we are practicing now has the lineage of instruction from Atisha on the taking of refuge, bodhicitta and the two points of bodhisattva training also integrated with the systems of Maitripa and Nagarjuna. 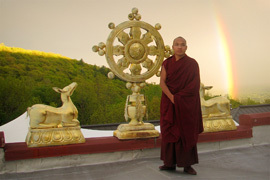 The development of bodhicitta is essential. 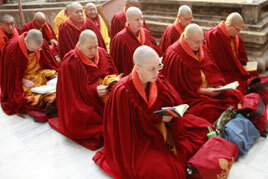 All the Buddhas and bodhisattvas attained realization through first developing bodhicitta within themselves. Because the realization of the bodhisattva level comes from developing bodhicitta, we need to follow the same system of developing bodhicitta within ourselves. The important subject of bodhicitta is actually a method of thinking, the essence of which is developing limitless loving-kindness and compassion. This is not the ordinary loving-kindness and compassion that we have for those close to us. 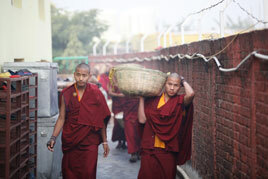 Instead, it is the development of an attitude of wishing to remove suffering and give happiness to all sentient beings. It is loving-kindness and compassion that is vast, limitless and profound. Ordinarily, the development of loving-kindness and compassion occurs when an individual sees someone suffering. When an individual develops the wish to liberate that being from the experience of suffering, this is compassion. 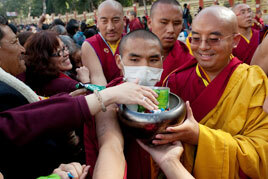 Knowing that all beings wish to obtain happiness, and wanting to give them happiness, this is loving-kindness. 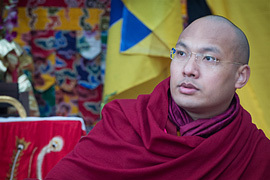 The development of loving-kindness and compassion for all sentient beings is necessary because all have one thing in common, the wish to experience peace and happiness, and not experience pain and suffering. It is not that 95% are longing for happiness and 5% just do not care. 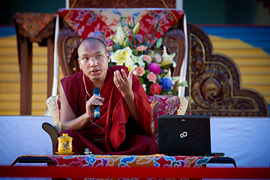 100% of all beings share this common wish of wanting to have happiness and be rid of suffering. Therefore, we have to include every single living being in our development of bodhicitta of loving-kindness and compassion. So in this way, we must extend our wish to liberate all sentient beings to even those beings in numerous other realms of existence. Although they might have different forms, the ultimate wish of all beings is the same, the desire to obtain happiness and be rid of suffering. We must develop compassion and loving-kindness to all living beings without discriminating between those we feel close to and those we dislike. It is necessary to not discriminate between friend and foe. This is the first characteristic of loving-kindness and compassion. Ordinarily, we try to help others in various ways. We give medicine to help relieve pain, illness and injury. We try to teach others so as to release them from the state of ignorance. 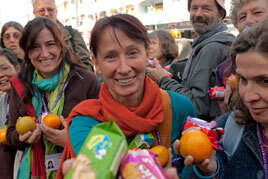 We try to help by giving material gifts to remove others from the state of poverty. We wage war to protect others from the fear of their enemies. This is the ordinary form of trying to help others. Although these efforts come from a wish to help, the type of help we have mentioned might lead to helping others, but also might lead to harming others. These are not methods that benefit every living being; we need to learn techniques that actually help all sentient beings. Since happiness and the source of happiness is a matter of the mind according to Buddhism, we must teach others how to develop mental happiness. 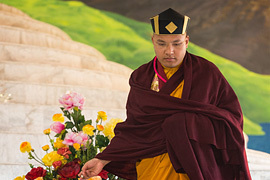 The wish to liberate sentient beings and teach them how to remove the root suffering of the mind, and how to attain the root happiness of the mind, is known as establishing sentient beings on the buddha-level. The wish to establish the root of happiness in others, remove their unhappiness and cause them to experience eternal happiness is known as bodhicitta. Bodhicitta can be explained by its Tibetan word jangchup-sem. Jang means removal: the desire to remove the root of suffering from every individual so that the individual no longer experiences the suffering mental state of conceptions and thought. Chup means acquainted: developing and establishing happiness within the heart or mind of living beings so strongly that it becomes very familiar. 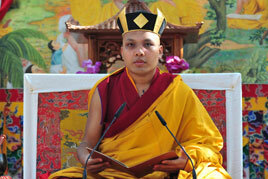 Sem means mind, so jangchup-sem means a mind that wishes to remove suffering and establish happiness. When the syllable pa is added to jangchup-sem, it becomes a noun and indicates a person who possesses such a mind. Pa is also translated as warrior or hero. Commonly we think of a warrior as an individual who makes war against others and is able to destroy his or her enemy. However, spiritually speaking, that individual is not really a warrior. Regardless of whether you destroy an enemy or not, that individual will eventually experience death. Everyone has to die, so there is no need to destroy someone we think of as an enemy who is subject to death anyway. This is not really being a warrior. The actual meaning of a warrior in the Dharmic sense is subduing the enemy of the mind so as to remove the root of suffering. Thus far we have explained bodhicitta and the development of bodhicitta through the wish to liberate all sentient beings. This is the warrior attitude. As beginners, we do not have bodhicitta firmly established within our minds. 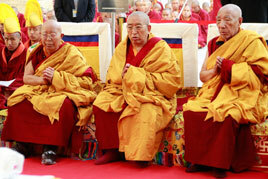 Therefore, we need to take the vow and make the commitment that we will develop bodhicitta always. There are many kinds of commitments or vows that are referred to as samayas. There are the pratimoksha vows or physical commitments such as not taking the life of other sentient beings and anything that does not belong to one. 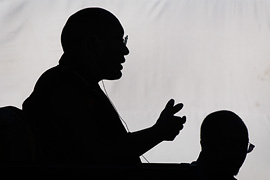 There are other vows called sosotarpa, the self-liberating vows. The bodhisattva vow is based on the mind. It seems easier to keep physical vows such as not killing or stealing, because as long as you do not take the life of sentient beings or steal anything, you are able to keep such vows unbroken. The bodhisattva vow is a matter of attitude and a way of thinking. Our mind develops many thoughts, both positive and negative, so it seems more difficult to keep a vow of the mind. However, although the pratimoksha physical vows, such as not to kill and steal, may seem to be easier, once you have killed the life of a being, or have stolen something, you performed the physical actions that break the vow. 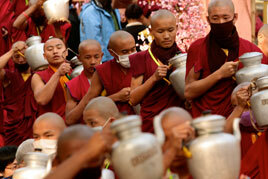 Therefore, the pratimoksha vows are considered to be like a clay pot. Once the pot is broken, it cannot be repaired. With the bodhisattva vow, although you can develop many negative thoughts, physically you have not performed a harmful action, such as having killed someone. You can immediately change a negative attitude into something positive. Therefore, the bodhisattva vow is considered to be a vessel that is made of gold; if it falls, it may get out of shape, but it can be repaired and returned to its original form. 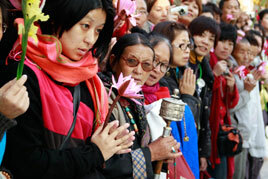 We should understand and appreciate our good fortune of having the opportunity to take the bodhisattva vow. We should not be afraid that we may be unable to keep the vow within our heart at all times. At the moment we realize we are developing a negative thought, we can always change and transform that attitude, so there is no need to be frightened about taking the vow. We also should appreciate the fact that we are able to learn such methods. We will now speak about the benefits of the bodhisattva vow. 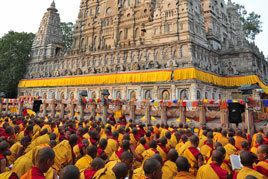 In the sutrayana teachings, there are 230 benefits talked about by the Buddha. We will condense these and explain them in four points. The first benefit of having obtained the bodhisattva vow is that through the practice of bodhicitta, we will learn how to remove suffering and obtain happiness. 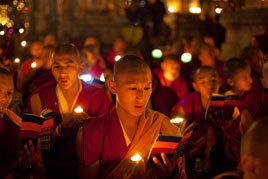 We will come to recognize that the root of all happiness is bodhicitta. Secondly, having developed bodhicitta, not only do we experience our own happiness that is free from suffering, but with the bodhisattva vow, we are able to benefit others by giving happiness and removing suffering. 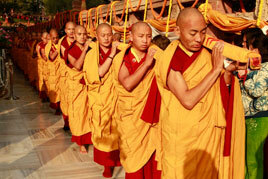 For example, a long time ago Buddha Shakyamuni turned the wheel of Dharma in India in a place known as Bodh Gaya. 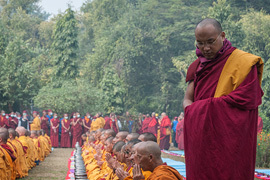 Because the Buddha turned the wheel of the Dharma and revealed the teachings, they spread to many other countries where people practiced them and achieved the complete realization of Buddhahood, the experience of ultimate happiness free from suffering. 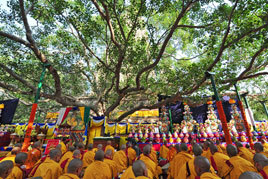 How did all those beings obtain Buddhahood? They did this by following the instruction of Shakyamuni Buddha. How did Shakyamuni Buddha himself obtain the level of the ultimate experience of happiness? 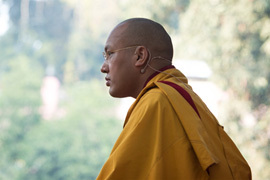 In the very beginning he developed what is known as bodhicitta. Through the development and perfection of bodhicitta, the Buddha was able to benefit limitless beings. When we begin to develop the altruistic attitude of bodhicitta, it may seem to be quite limited, as a very small number of such thoughts arise in our mind, and we think this really cannot help anybody. However, in the long run, as bodhicitta develops, we become more familiar with it and realize that this buddha activity is the source of all happiness, and the method to remove suffering and benefit uncountable beings. The third benefit of obtaining the bodhisattva vow and developing bodhicitta is that since we all have our greatest enemy within ourselves, the conflicting emotions, through which we experience endless suffering, it is bodhicitta that gives us the strength to overcome these conflicting emotions. Bodhicitta is like a sword that cuts through all suffering . The fourth benefit of developing pure bodhicitta is that it is the root of obtaining ultimate happiness for self and others. If it is not pure, we can not experience happiness, nor can we teach others to experience happiness. Bodhicitta is like a precious, wish-fulfilling jewel. 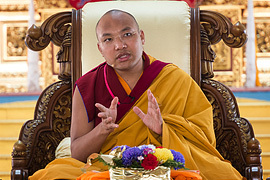 This teaching was given by the Ninth Khenchen Thrangu Rinpoche at Karma Triyana Dharmachakra on November 9, 1985. It was translated by Chojor Radha.